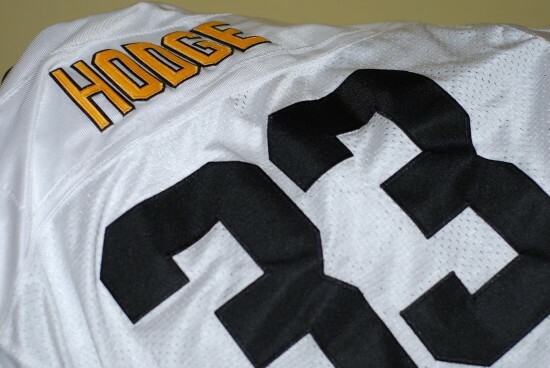 Here’s my husband’s new Merril Hoge jersey he purchased on eBay for the price of dirt cheap. 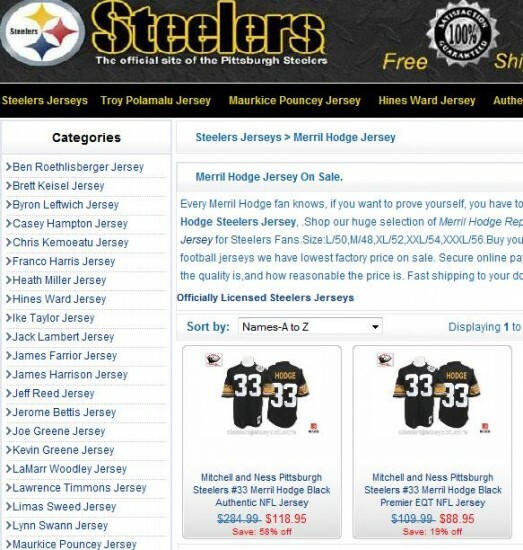 So I hunted around, and would you look at this “official site” of the Pittsburgh Steelers selling “Cheap Merril Hodge” jerseys? I’m about to shock your pants off. The site is registered to a company in China. I bet Cordel Stuart jerseys sold like wildfire ten years ago. Actually, the only thing that shocks me is that your husband didn’t buy the Jeff Reed jersey – if for nothing more than to see your reaction when he wore it. I took a couple years of high school Spanish and all I really rememeber are the dirty words (first thing we taught ourselves, of course). I would love to see how bad they butcher a Chris Fuamatu-Ma’afala jersey if they cant get Merrill’s jersey correct. I’ll bet those Limas Sweed jerseys are just flyin’ off the shelves, too. If it’s really not the “official site”, then the lawyers should get on the stick damn quick. If it is, then the Steelers have some tall explaining to do. The league should have something to say about this as well. Trademarks and such are why the legit stuff costs so damn much. My pastor would never tolerate a jersey in church. Really? You should’ve heard Merril this morning on DVE after Randy told him about this….very funny…. The NFL and the government have been trying to shut down these Chinese knockoff sites for some time now, but they keep popping back up under new names. Scott, my church is casual. The worship leader wore a Polamalu jersey this week. @Dan (Not Onorato): I am the only person in the WORLD who has a Fuamatu-Ma’afala jersey and I’m damn proud of it :) AND, his name IS spelled correctly. But can they get a ‘He Hait Me’ one? No worries, the fact that you’re there is what matters. I bought a dirt cheap Steelers sweatshirt down at the Strip the first year I lived in Pittsburgh. It wasn’t until 5 years later that my husband and I noticed why it was life so dirt cheap – it said we were in the NFC. Man, I once say this Chad Johnson jersey, but they misspelled his last name “Ochocinco.” Crazy! 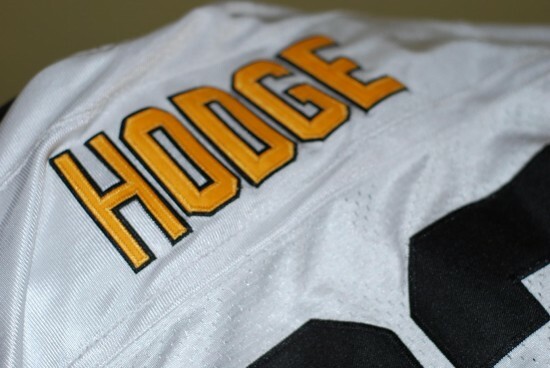 The Polamalu lteetrs on the back of the jersey were not all the same size. This is very noticeable. The quality of the jersey is bad as well. This jersey is definitely a fake NFL jersey. Also I bought the replica and received the authentic, which I wouldn’t complain about had it been real. Maybe the lteetrs would have at least been of the same size on the replica.